This article was originally published on Independent Australia on 12 August 2014. The Victorian Napthine Government’s dismal record on stewardship of the environment is only equalled by its blatant disregard for the health and welfare of some of its citizens — especially the most vulnerable, our children. Deputy editor, Sandi Keane reports. In May this year, with its smelter operation due to close this month, Alcoa was issued a fresh licence to generate and sell its electricity into the grid. This filthy, sulphur-belching brown coal plant at Angelsea on Victoria’s iconic Great Ocean Road – now up for sale – operates just over one kilometre from a primary school and 500 metres from residents’ homes. This is the Government that demanded two kilometre setbacks for clean energy wind farms. In spite of the 2011 Senate finding and twenty reviews since proving no link between wind turbines and illness, the Government’s complicity in fostering these debunked claims saw an estimated $3 billion in wind investment go into free-fall. So much for Victoria’s slice of the future low carbon economy. That’s the price Victorians and future generations will pay for the lax donor laws in this country that allow vested interests, like mining and developers, to launder millions into Liberal party campaign coffers through so-called trusts (as recently revealed by ICAC in New South Wales) and, thus, dictate policy outcomes. 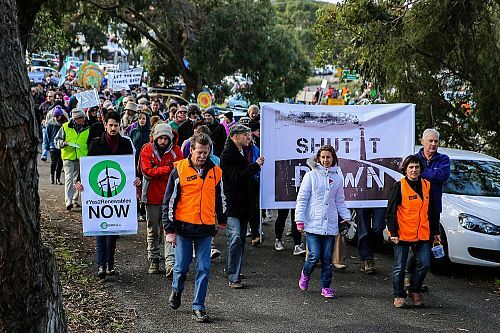 When the Coalition was elected to Government in Victoria in 2010, Premier Baillieu overturned the former Brumby government’s decision to shelve all brown coal licences, re-opening the floodgates. As a result, some 87 per cent of Gippsland, Victoria’s prime farmland, is under one sort of mining licence or another. Future food and water security was not a consideration. 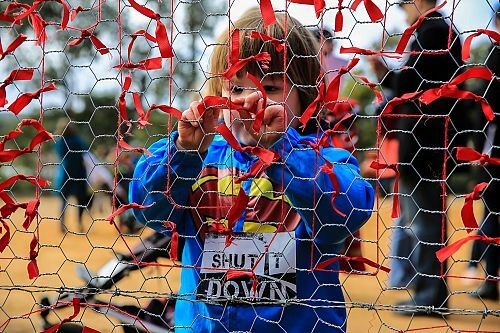 But, like the massive anti-CSG protests, more and more Victorians are standing up for their democratic rights. The 50-year-old Alcoa plant is the third largest emitter of the known respiratory irritant, sulphur dioxide. 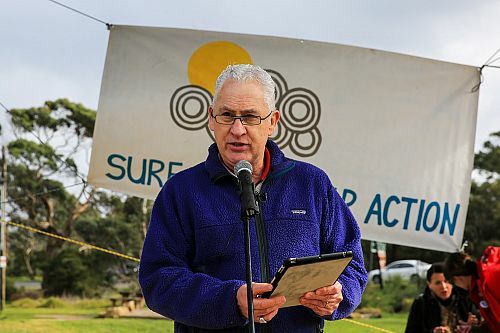 On Sunday, 700 marchers joined the Anglesea rally organised by Surf Coast Air Action (SCAA) to urge the State Government to close it down on public health grounds. Key speakers and supporters included Rob Gell, Doctors for the Environment Australia, Environment Victoria, GetUp! And Friends of the Earth. The toxic pollutants fouling the air of this once-pristine surf beach town has seen it named as a ‘National air pollution hotspot’. emits particulates (a recognized carcinogen) as well as arsenic, lead and mercury. The only power plants in Australia emitting more SO2 than Alcoa Anglesea (Bayswater in the Hunter Valley [63,000,000 kg] and Loy Yang in the Latrobe Valley [49,000,000 kg]) produce 17.6 and 14.7 times more electricity than Anglesea respectively. Even the old and notoriously polluting Hazelwood power plant in the Latrobe Valley emits only ⅓ of the SO2 emitted by the Anglesea facility, despite producing ten times the power output. Geomorphologist and former weather presenter Rob Gell addresses the crowd. Without any regard for community consultation, Alcoa is now calling for “expressions of interest”. Victorians fear that interested companies, including foreign-backed corporations, may be eyeing off the coal that lies beneath the fragile National Estate listed Anglesea Heath as an export opportunity through the port of nearby Geelong. Denis Napthine once damned the Labor Government as “hypocritical when it comes to climate change” but has watered down the bilateral agreement with the former Labor Government of a 20 per cent reduction in emissions by 2020 to just“aspirational” only. 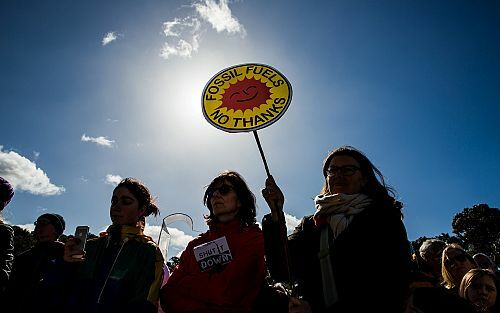 For a further look at the role of vested interests and political patronage, see ‘The fossil fuel industry and who really runs Australia’. This entry was posted in Environment, Mining, Politics by skepticslayer. Bookmark the permalink.